cidaas allows administrators to create users. Roles and groups can be assigned which defines the individual user previleages . To create a user, navigate to: cidaas dashboard page -> Users -> “Create User”. 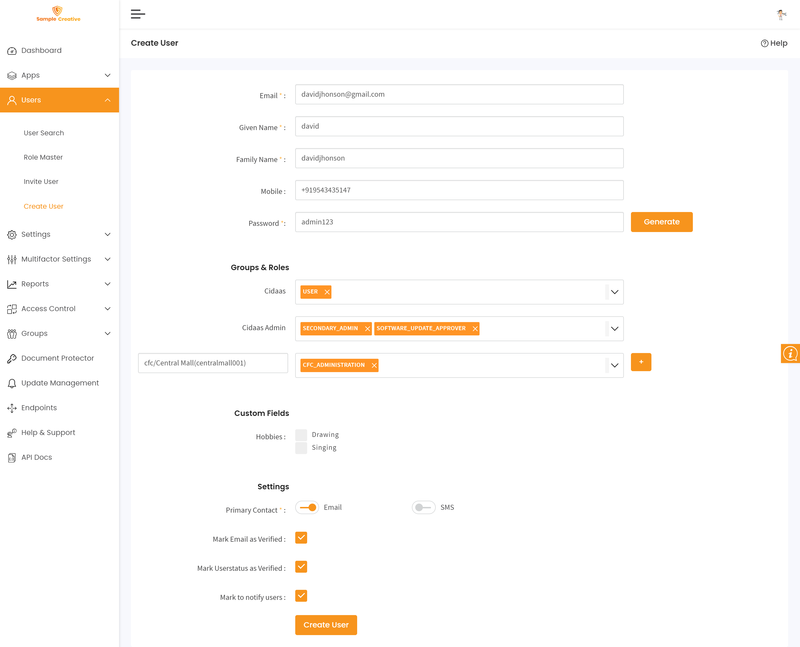 Based on the custom fields defined under the Registration section, the parameters shown on the create user screen changes. Note * mark fields are mandatory. 1. Email: If Administrator selects "Email" option button, then the email ID must be mandatory. 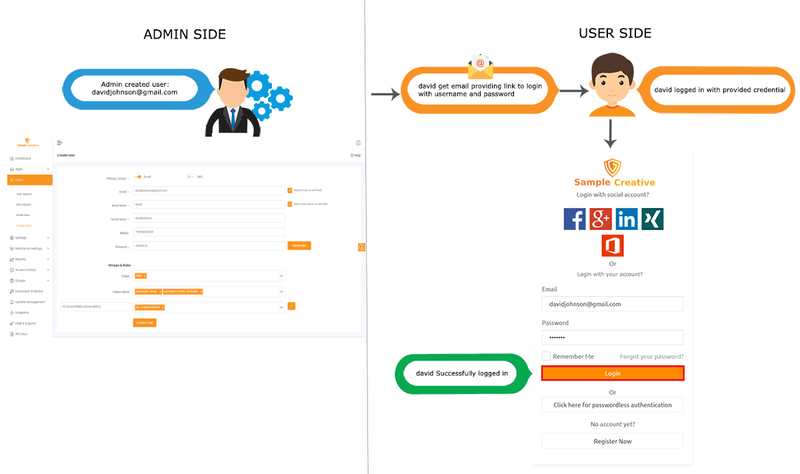 Once user is created a notification will be sent to the corresponding Email ID. 2. SMS: If Administrator select "SMS" option button, then the Mobile number must be mandatory. Once user is created a notification will be sent to the corresponding Mobile number. 3. Mark to Notify Users: When this option is checked, cidaas sends notifications to the user’s registered Email ID/Mobile number. If this option is not checked, no notifications are sent to the user. However, in spite of not checking this option, if the Administrator wants to send notifications to the user, the “Resend Verification Email/SMS” option could be used. 1. Enter appropriate email id of the user. For example: abc@gmail.com. 2. 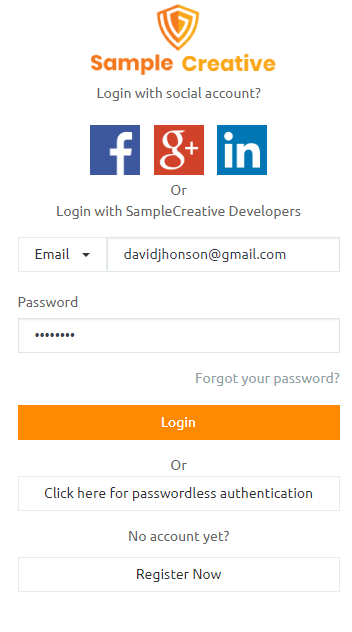 Enter password manually or click on "Generate" button (an automatic password get generated) to the user. For example: 09876543. 3. Enter user first name. For example: smith. 4. Enter user last name. For example: john. 5. Select appropriate user role from the drop down. For example: USER/HR/Manager/Team Lead. 6. Select appropriate client ID from the drop down based on app settings. For example: b4b2cf5gh7jk. 7. Based on the app the appropriate redirect URL is selected. For example: https://sampleeshop.redirect-uri. Administrator can specify the created user&apos;s roles to the specific groups here. The type-ahead search allows to find the right group even from a large number of groups. Note: Typeahead search is a method for progressively searching and filtering through text. The immediate feedback allows the user to find what they are looking for quickly – much easier than executing a number of searches in a row. An administrator can specify custom fields to the invited user. These are fields within the registration fields. Note: These custom fields are not mandatory for "invite user" funtion, even though they may be mandatory on the registration fields. 9. If Administrator, selects checkbox against the Mark Email as Verified, the user email ID gets activated automatically. 11. If Administrator, selects checkbox against the Mark User Status as Verified, the user status gets activated automatically. If Administrator, unchecks checkbox against Mark Email as Verified, until user confirms the verification link in email, they cannot logon to cidaas portal. 12. Click "Create User" button now and a message window pop ups "Created Successfully". 13. Click "OK" button. 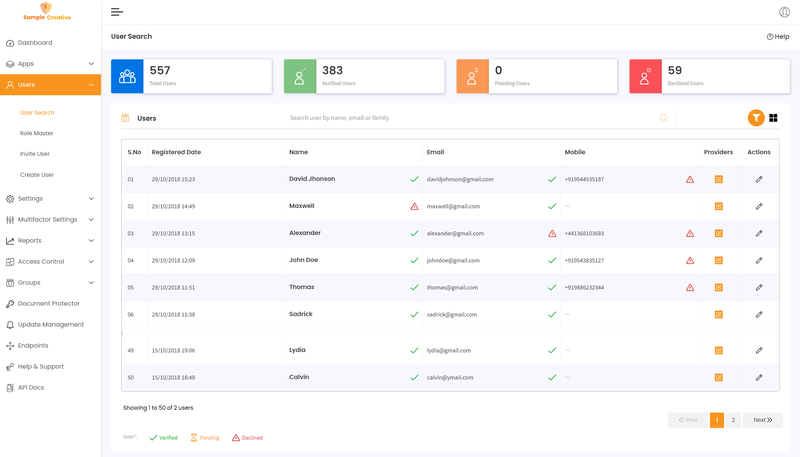 Once user account is created an automatic notification mail will be sent to created user&apos;s email ID, along with the username and password of user. 15. Enter Email and the password as per the notification. 18. 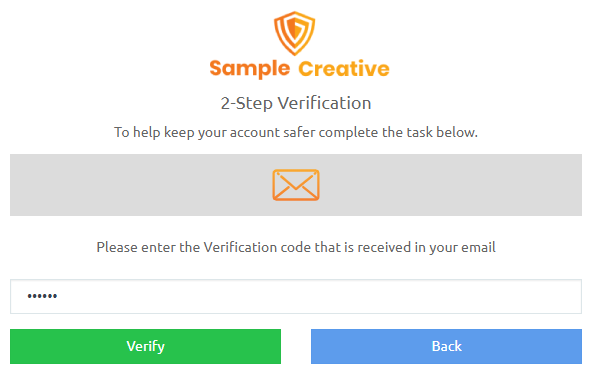 Enter verification code which was sent to user email ID, as shown. 19. Enter six digit verification code and click "Verify" button. Once code is verified it redirects to User self-service portal. 20. 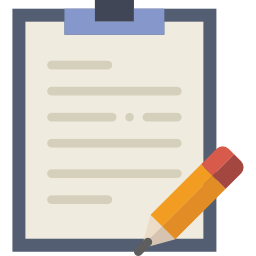 If Administrator, unchecks the checkbox Mark User Status as Verified, then the cidaas administrator needs to activate the User Status manually. 21. Select appropriate roles from the drop down. 22. Now select appropriate cidaas Administrator role from the drop down. 23. Select appropriate groups from the drop down. 24. Click "Create User" button, a message window pop ups "Created Successfully". 25. Click "OK" button. Once user account is created an automatic notification email is sent to the created user&apos;s email ID, along with the username and password of the user. 28. Enter Email and the password as per the notification. Note Password can be changed anytime by the user. 31. If user tries to login using the social providers i.e. Facebook, Gmail, Google, etc. then the system throws an error message "user already registered with this email".